Rapid urbanization places increasing stress on already burdened transportation systems, resulting in delays and poor levels of service. Billions of spatiotemporal call detail records (CDRs) collected from mobile devices create new opportunities to quantify and solve these problems. However, there is a need for tools to map new data onto existing transportation infrastructure. In this work, we propose a system that leverages this data to identify patterns in road usage. First, we develop an algorithm to mine billions of calls and learn location transition probabilities of callers. These transition probabilities are then upscaled with demographic data to estimate origin-destination (OD) flows of residents between any two intersections of a city. Next, we implement a distributed incremental traffic assignment algorithm to route these flows on road networks and estimate congestion and level of service for each roadway. From this assignment, we construct a bipartite usage network by connecting census tracts to the roads used by their inhabitants. 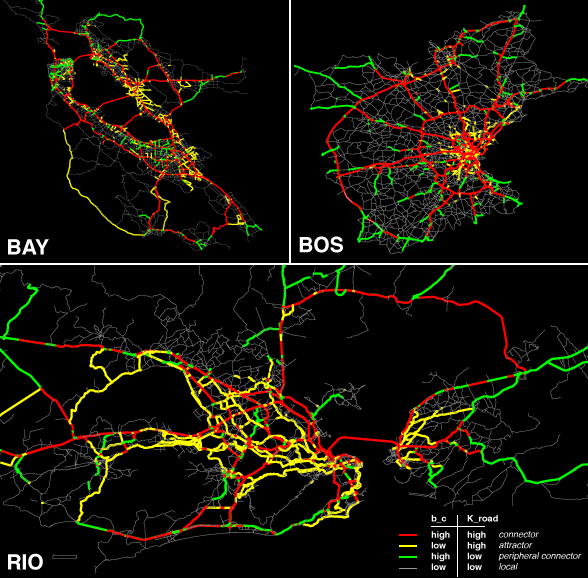 Comparing the topologies of the physical road network and bipartite usage network allows us to classify each road’s role in a city’s transportation network and detect causes of local bottlenecks. Finally, we demonstrate an interactive, web-based visualization platform that allows researchers, policymakers, and drivers to explore road congestion and usage in a new dimension. To demonstrate the flexibility of this system, we perform these analyses in multiple cities across the globe with diverse geographical and sociodemographic qualities. This platform provides a foundation to build congestion mitigation solutions and generate new insights into urban mobility.